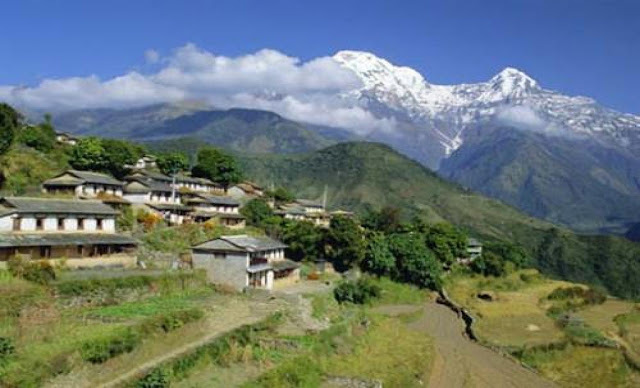 Gurung Heritage Trail of Ghanpokhara One of the short, easy and popular Gurung Heritage Trail trekking in Annapurna area, lies western part of Nepal. Providing a wonderful insight into Nepalese rural life with few uphill climbs of any significance. Gurung Heritage Trail of Ghanpokhara One of the short, easy and popular Gurung Heritage Trail trekking in Annapurna area, lies western part of Nepal. Providing a wonderful insight into Nepalese rural life with few uphill climbs of any significance. This area is also home to the famous honey hunters of Nepal. This short trek is the perfect compliment to discovering some of the other highlights of Nepal – historic towns, white water rafting and the country’s most famous conservation area. The view from the villages stretches from Buddha Himal (6673m), himalchuli and Manaslu (8156m) to the northeast Mt. Lamjung and Annapurna II to the north and Mt. Machhapucchre and Annapurna South to the Northwest. The approach to Ghalegaun-Ghanpokhara is a wonderful experience; the mists of the early mornings, the beautiful Khudi and Midim rivers; beautiful rhododendrons; chirping sound of the birds simply takes one to the far away place and completely with the nature. The trekking route passes through he dense forests, villages and awesome waterfalls. This route attracts novice trekkers and walkers and nature lovers because of its lower altitude although there are some very good views of the Himalayas without actually having to ascend into them. Trekkers carry only day pack and walk at their own pace. Culture – Buddhist and Hindu religon. Himalayan Sights – Spectacular views of Annapurna, Fishtail, Hiunchuli and many other peaks. Attraction of the trek – Gurung Village. Day 02: Kathmandu valley sightseeing tour. Day 10: Drive back to Kathmandu hotel. Day 11: Final Departure from Kathmandu.